Size: 5.8" x 2.6" x 0.75"
At first glance this early Sharp EL-503 scientific calculator looks not really exciting. A bulky housing, a very limited keyboard with just 28 keys and a LCD display with only 8 digits ranks the EL-503 even in the 1979/80 timeframe at the lower end of the list. Dismantling the EL-503, on the other hand, reveals a big surprise: This calculator makes use of a Texas Instruments TP0327 single-chip calculator circuit based on the TMS1000 Microcomputer family. 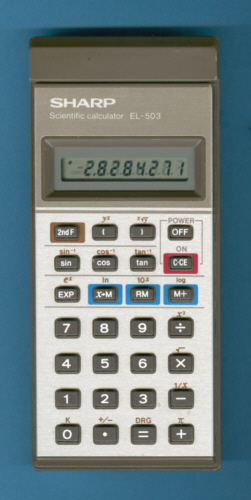 The TP0320 architecture was introduced in 1978 and powered the Slimline calculators family centered around the Texas Instruments TI-50 and Business Analyst II. Running Mike Sebastian's "Calculator forensics" gives a result of 9.177087103, well-known since the TI-30 introduced in 1976.